The Ingenium was a device powered by souls, designed by the sorcerer Vuhon and a Dunmer named Sul, created by making a pact with Clavicus Vile, who had a penchant for souls. 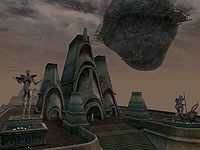 The device's main function was to hold Baar Dau over Vivec city after the disappearance of Vivec. This process started by using prisoners and undesirables, which resulted in their immediate death. Eventually, it used souls which could continue to feed the Ingenium without causing immediate death. When Sul's lover, Ilzheven, was taken he destroyed the Ingenium in an attempt to save her, causing Baar Dau to crash, setting off the eruption of Red Mountain and devastating Vvardenfell and part of mainland Morrowind. This event became known as the Red Year. The disaster of the Red Year effectively ended the ascendancy of the Tribunal Temple and the mainstream worship of the Tribunal as gods.